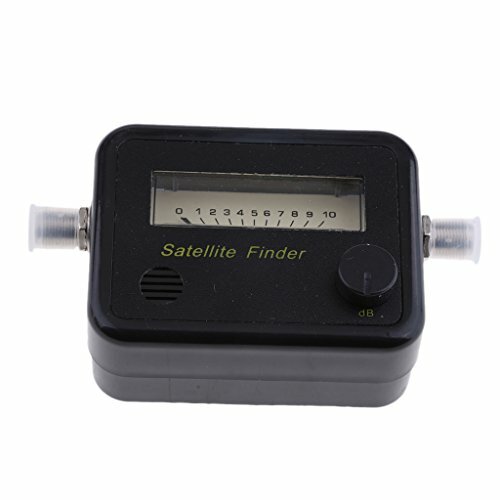 - Satellite Finder with Analog Meter,Satellite Finder Meter,adjustable meter strength. - Easily locate your satellite signal,Connects to your digital satellite line to easily calibrate the optimum signal. - Satellite finder that helps to make precise dish set-up easily,its ultimate sensitivity will indicate 0.2 dB level difference in 950 to 2050MHz. - Now with H/V and 22KHz indicators,Indicator lights for verifying that your receiver is set to Horizontal or Vertical polarity and if 22KHz tone is on or off, Green H/V light indicates Vertical Polarity. - Red H/V light indicates Horizontal Polarity,Red 22KHz light indicates 22KHz is ON. - When aligning a C-band dish do not use your meter in front of the dish to avoid full scale readings. - Freq Resp: 950 MHz-2050 MHz. If the meter needle is jumping the sensitivity is too high. Adjust the S.A. level on the back of the meter by punching through the label where marked,Be very careful not to damage the adjustment by turning it too far or too hard. Satellite Finder with Analog Meter,Satellite Finder Meter,adjustable meter strength. Easily locate your satellite signal,Connects to your digital satellite line to easily calibrate the optimum signal. Satellite finder that helps to make precise dish set-up easily,its ultimate sensitivity will indicate 0.2 dB level difference in 950 to 2050MHz. Now with H/V and 22KHz indicators,Indicator lights for verifying that your receiver is set to Horizontal or Vertical polarity and if 22KHz tone is on or off, Green H/V light indicates Vertical Polarity. Red H/V light indicates Horizontal Polarity,Red 22KHz light indicates 22KHz is ON.